At our events, sparks fly. AgencySparks regularly connects professionals across the entire marketing industry spectrum with our uniquely-themed events. Whether it be a brand marketers-only breakfast, or an agency-brand marketing speed dating event, we always have a good time connecting the best with the best. Our next event is May 2, 2019! Our events are focused on bringing together senior-level, brand-side marketers and agencies currently under contract with AgencySparks. Thank you for your interest in an AgencySparks event. We will be back in touch within one business day. Valentine’s day morning, marketers entered the Miami Ad School @ Portfolio Center ready to network their hearts out at our ever-popular speed-dating #MarketersBreakfast event. Read the whole event recap here! This quarter, the breakfast served as a reflection of 2018 marketing efforts. Attendees discussed many topics, including the value of specialist agencies, the growing number of in-house agencies, and the key differences between client-side marketers and agency-side marketers. Read the whole event recap here! Over the past four months, AgencySparks has been conducting its first annual Marketing Relationship Survey, where we talk to senior-level marketers from major brands about their agency relationships. At this #MarketersBreakfast, we gave attendees a sneak peek of the fascinating insights we've uncovered. Read the full recap, event photos, and preview some of the key insights discussed here. 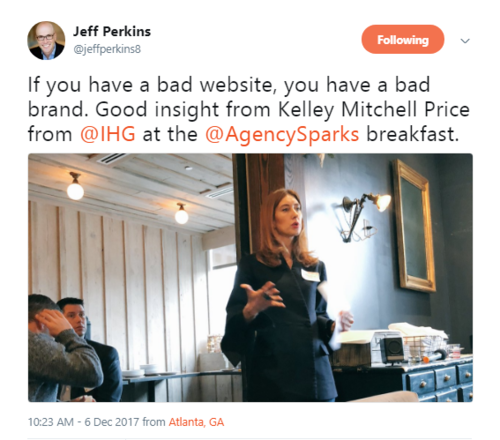 To lead this breakfast’s discussion, AgencySparks invited Christien Louviere from SellPersonal to discuss marketing tools and the best practices for selecting a proper tool for a company. Louviere answered several questions about how he helps clients evaluate and select new tools and the process to replace tools. This year, we brought back our famous "speed-dating" format, pairing senior brand marketers with each of our agency partners for five minutes. We gave each table conversation cards - but the conversations grew organically! Although speed dating can seem “forced,” attendees described the event as “easy-going.” The format encouraged natural conversations with people who may not have met otherwise. You can find pictures from the event and read the full event recap here. Kelley Mitchell Price, the Global Director of Digital Product Strategy & Experience Design, from InterContinental Hotels Group (IHG) was the centerpiece of the discussion, sharing insights from her 15 years focusing on exceeding customer expectations. Read the full event recap/pictures here. Marketing is all about creativity. The goal of this particular event was all about igniting creativity in attendees. The discussion revolved around how to stay creative in marketing. Then, we challenged each marketer to create something with modeling clay. The results were intriguing! Read the full event recap here. During this event, we wanted to gain insights from senior marketers and agency leadership about how they measure the performance of their marketing initiatives. AgencySparks solicited questions in advance from the marketers to serve as a catalyst for the discussion. Read the full event recap here.